SEOUL, March 15 (Yonhap) — Songs from idol group Wanna One’s unreleased album have been leaked online, the group’s management agency said Thursday. “We’ve learned that music files were leaked Wednesday and are currently looking into the matter,” a representative from YMC Entertainment, the group’s management agency, said. 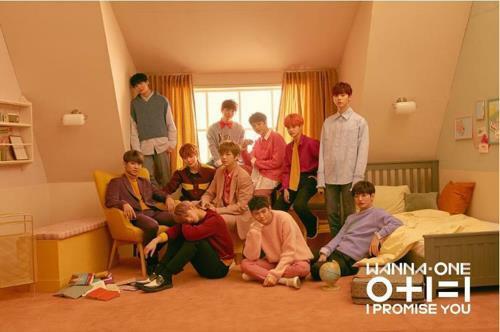 Since Wednesday, “Boomerang” and “Gold” from Wanna One’s second EP album, “0+1=1 (I Promise You),” have circulated over several social media platforms. The album is scheduled to come out on Monday. The company also posted a statement on Twitter, warning of legal actions against those who share and consume the music through piracy. “Illegal distribution is a serious crime of copyright violation. We will seek civil and criminal charges against the source of the leak, people who share the pirated contents as well as those who consume through piracy,” YMC said through Wanna One’s Twitter account. Currently over 700,000 copies of the new album have been preordered. The project band is comprised of 11 final winners of the popular elimination reality show “Produce 101 Season 2″ on music cable channel Mnet. The group won awards for Best Male Group, Best New Male Artist and Best of Next Artist at the 2017 Mnet Asia Music Awards.